With a 320W Sunshine Solar Caravan & Motorhome Kit you could expect to generate around 106 amps per day during the summer months when used in conjunction with the MPPT Single Battery Controller supplied with the kit as standard. 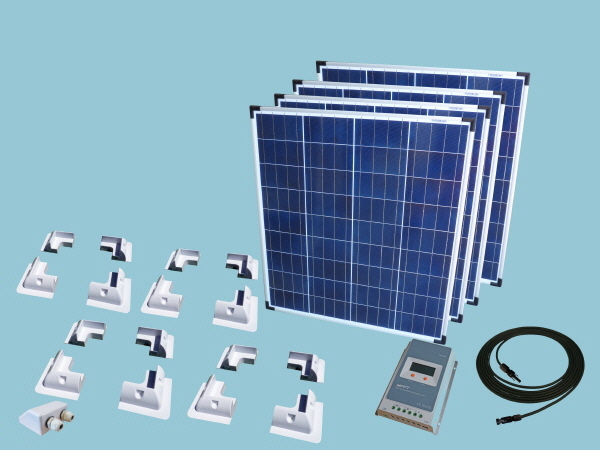 MPPT Controllers offer 10%-30% more solar power generation depending on the solar panel specifications, in short the higher the solar panels open circuit voltage (Voc) the harder an MPPT Controller works. To maximise the power generated these two panels should be linked together in series the first panels positive connected to the second panels negative then negative off the first panel and positive off the second solar panel to the solar controller, this will double the voltage generated by the solar panels making the system suitable for 12 volt or 24 volt battery charging. This 320W Sunshine Solar Caravan Motorhome & Boat Kit includes an MPPT single battery charge controller for one battery bank as standard for dual battery charging just add a Battery Master to the system see Often purchased together items. Save Money..... Don't forget you can save money on add-ons to compliment your solar kit such as the Remote Meter, not only does this give you valuable data about the overall performance of your solar panel it also gives you info on your battery state of charge and makes setting up your system easier. You may also wish to add some Bostik-360 Fixing Adhesive at a reduced price for bonding the solar mounts and cable entry cover.